Please join us for an evening of Indian Music by established and upcoming artists. 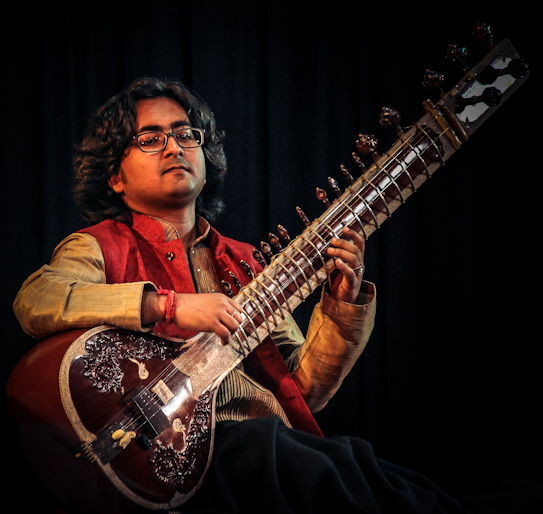 Sitarist Subho Chakraborty belongs to the Maihar-Seniya Gharana of Hindustani Classical Music. He has been enchanting music lovers and connoisseurs with the magical felicity of his recitals throughout years. 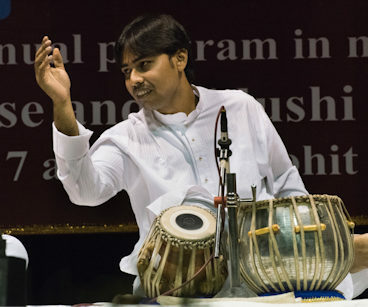 The unique mellow tone, Gayaki Ang (closely following the Khayal style of vocal music), cogent and contemplation improvisation of the Ragas have earned him a lot appreciation from distinguished audiences across India as well as abroad. Aside from his career as a classical musician, Subho is quite well known as a composer and accompanist in film and popular music. Born with the musical legacy of his mother, Smt. 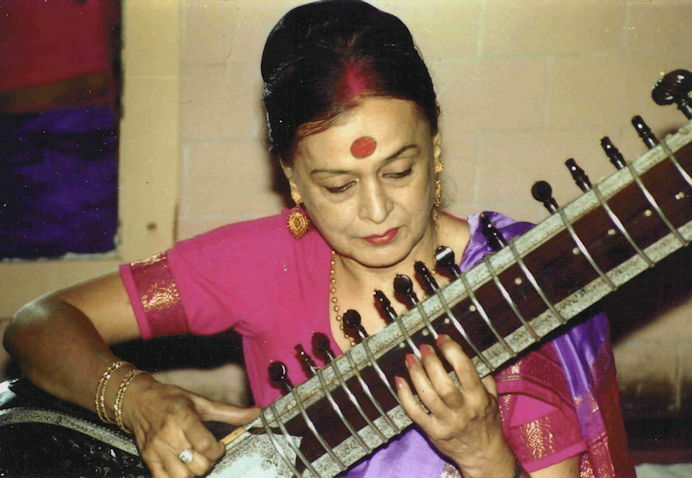 Anju Chakraborty, a noted Dhrupad singer, and brought up in the enriched versatile musical milieu of his family, Subho started learning sitar at a very tender age under the tutelage of Shree Prafulla Kumar Parbat, a disciple of several maestros of instrumental music from a variety of gharanas. Later he continued his taalim under the sagacious guidance of the eminent sitar maestro, Shree Debiprasad Chatterjee, and still later has been blessed with the efficacious tutoring of the doyen, Shree Partha Chatterjee, thus both his teachers being prodigies of the Maihar-Seniya Gharana and disciples of the stalwart, Pt. Nikhil Banerjee. Subho received the first prize in the senior Group of the Dover Lane Music Conference, Kolkata, in 1989. Besides his impressive renditions in Chhandayan Music Circle (Kolkata), Youth Guild & Cultural Department of the USSR Consulate General (Kolkata), Kal-Ke-Kalakar Sangeet Sammelan (Mumbai), Dover Lane Music Conference [Periodical], Jhankar Music Circle, West Bengal State Music Academy (Young Talent), Subho has been highly applauded for his notable performances at the Indian Council of Cultural Relations (Kolkata & Pune), India Habitat Centre (New Delhi), Bhowanipur Sangeet Sammilani for a number of times. He has conquered the hearts of numerous listeners and music critics in many concerts in cities like Bengaluru, Guwahati, Kanpur, Agra, Ranchi, Gurgaon and so on. He has represented Indian Classical Music in Japan through a series of solo concerts and lecture-demonstrations. Subho has toured Bangladesh also for a series of performances and recordings with eminent music directors. Subho is an empaneled artist of the ICCR, New Delhi. He performs regularly on the All India Radio and Doordarshan, Kolkata. His recitals are broadcast regularly in London too. His accolades include the Suramani Award conferred on him by the Sur Sangeet Samsad, Mumbai and Sangeet Shiromoni Award received at the International Dance & Music Festival, 2014. His audio albums on Raga Bhairav and Bhairavi and Yaman and Mishra Kafi are available in USA and India, respectively. Subho has documented his concept and review on the background music of the renowned film director Ritwik Ghatak. He has participated in discourses at numerous music conferences, such as the Dover Lane Music Conference, West Bengal State Music Academy, Indo-Japanese Meet Festival, Russian Festival for Young Talents. He is attached with reputed training colleges and music institutions in Kolkata. He is also an examiner of the Rabindra Bharati University, Kolkata and the Vishwa Bharati University, Shantiniketan. Brajeswar Mukherjee is a well known Hindustani Classical vocalist from Kolkata, India. A disciple of the eminent vocalist Pt. 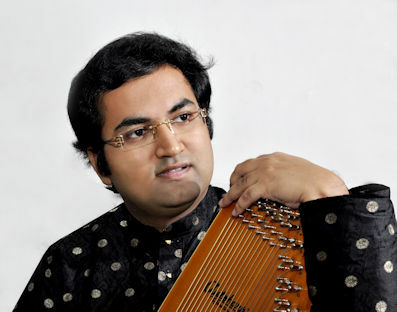 Ajoy Chakraborty since an early age, Brajeswar has earned popularity with lovers of Indian classical music all over the world through his radio programs, live performances and published albums. Brajeswar Mukherjee is a recipient of many awards and honours, including ‘Dhananjay Smriti Puraskar’ from Calcutta University, Shrutinandan Puraskar from Shrutinandan Institute and ‘Gaan Vardhan’ from Pune. Currently a Musician Tutor and Junior Guru at ITC SRA, Kolkata, Brajeswar is a B-High Grade regular artist of All India Radio, Kolkata. Brajeswar was born in the small village of Borsul in the Burdwan district of West Bengal, India. Fortunate to have born in a musical family, he started training in Indian classical music from the tender age of four from his father Shri Bankim Mukherjee, a noted ‘Jatra Pala’ singer. For the next few years, he honed his musical skills learning from Shri Asit Roy and Shri Hara Kumar Chatterjee of his hometown. The greatest moment in his music education arrived when Brajeswar, all of ten years of age, was accepted by the celebrated vocalist Pt. Ajoy Chakraborty as his disciple in the true Gurukul tradition. As an inmate in Gurujee’s (as Pt. Ajoy Chakraborty is called by his student with loving respect) house, Brajeswar trained in the scientific ‘Shrutinandan’ system of learning, devised by Pt. Chakraborty himself. After a few years of hard training, Brajeswar started guiding the young disciples at Shrutinandan, even while fine tuning his own musical expertise. Another milestone in his musical journey came in 2010, when was selected in the ITC Sangeet Research Academy (SRA) as a grade A scholar. He currently a musician tutor at ITC SRA, where he continues to train under Pt. Ajoy Chakraborty. Brajeswar has given solo performances at popular events such as ITC SRA Mangaldeep Sammelan, Legends of India, Kolkata, Sankar Darabar at Nanded, Nadam - organised by Tabla maestro Pt. Kumar Bose at Kolkata and the Dharwad Music Festival. He has performed at prestigious institutes such as NCPA Mumbai, India Habitat Center and Rajya Sangeet Academy. Brajeswar also gave solo performances in USA, UK, Greece and Bangladesh. Since 2003, Brajeswar Mukerjee has been accompanying his guru Pt. Ajoy Chakraborty on harmonium or as vocal support in concerts all over the world. He has sung with legendary artists such as Dr. Balmuralikrishnan. Brajeswar is also a popular artist with overseas audiences, having given many enthralling performance in cities like USA, UK, Greece and Bangladesh, London, New Orleans and Charlotte. He is a B-High grade artist of All India Radio and has many radio renditions to his name. Debjit Patitudi started learning tabla at the age of three from his father Shri Amal Patitundi, a senior disciple of Pandit Sankha Chatterjee. Debjit continued to nurture his passion diligently under the guidance of Pandit Sankha Chatterjee for several years and thereafter he is continuing his lessons from the Tabla Maestro Pandit Subhankar Banerjee. In 2015 Debjit performed in Spain as part of a tour conducted by The Ministry of External Affairs, Govt. of India (I.C.C.R.). He also performed in the Prestigious Tirupati Festival, Music concert organized by Sangeet Research Academy, I.T.C. Mumbai in 2005 and 2010. He is a regular artist of All India Radio and Doordarshan. He has earned his reputation both as a soloist and an accompanist. 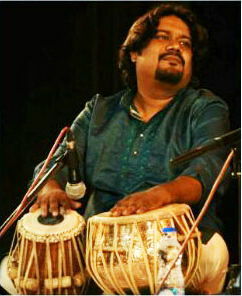 Debjit is the recipient of The President Gold Medal Award from the Government of India for securing First position in the category of tabla in the All India Radio Competition in 2009. He was awarded by the State Academy Award by the Government of West Bengal in 2003. He also received Pandit Nikhil Ghosh Award from I.T.C Mumbai in 2010 and Pandit Prasun Banerjee Award, Kolkata. Doyel Ghosh recently graduated from the Rabindra Bharati University with excellent score in Rabindra Sangeet. She has been studying classical music and several types of Bengali song from the renowned preceptor Smt. Rajyasree Ghosh. Doyel has performed in Bangladesh and also performed at Rabindra Sadan in 'Kobi Pokhkho' organized by West Bengal State Music Academy. She received the Sri Sri Kanak Maa Memorial Scholarship. She is grateful to be a part of Chhandayan. Aakhi Roy is in the Master of Arts program in Rabindra Sangeet department at the Rabindra Bharati university. She recently passed the National Eligibility Test examinationand got the Junior Research fellowship award. She is a student of Smt. Rajyasree Ghosh. 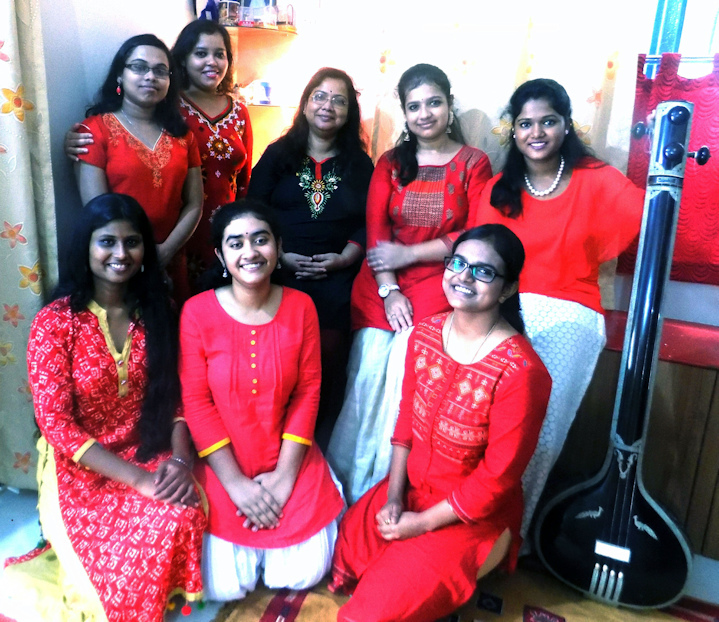 Anhiti Naskar began her training in classical singing and raga-based Bengali songs from Prof. Rajyashree Ghosh in 2008. During this journey she has significantly developed her musical skills. She has also won the first prize at Nikhil Banga Bhajan Competition held by Amibodh Society. She is also awarded a two years scholarship from the same organisation. Presently she is doing her graduation in music from Bengal Music College under the University of Calcutta. Srijita Guha is an Electronics and Communication Engineering student. She has been undergoing extensive training in classical singing under the guidance from Smt. Rajyasree Ghosh for the past ten years. Shestarted her Musical training at the age of four under the guidance of her father Sri Avijit Guha. Since childhood she stood first in various Musical Competitions. She was a regular performer in various children's programs conducted by All India Radio, Kolkata. She has also performed in different cultural programs. She aspires to excel in the field of music. Piyali Chatterjee started learning classical singing in her childhood under guidance of Shri Shubhomoy Bhattacharya. Now she is taking advance training from Smt. Rajyasree Ghosh. She stood 3rd in Khayal competition at the West Bengal State Music Academy. She passed M.Ain music from the Rabindra Bharati University. Debadrita Mukherjee is twenty years old. She has under graduate degree, specialised in chemistry. She is learning singing from Smt Rajyasree Ghosh. Hemantika Mukherjee is a student of 10th grade and is learning classical singing for 10 years under the guidance of Smt. Rajyasree Ghosh. She has already won a few awards at different school events. She has also won the 4th position at a competition arranged by Kajalrekha music foundation. Possessing the rare feat of winning top positions simultaneously in Khayal and Thumri at the age of 20 in the All India Radio Music Competition and also receiving the Top Grade (the highest title of “Pandit”) from Prasar Bharati Broadcasting Corporation of India at only 44 years of age, Shantanu Bhattacharyya’s singing has been described by the greatest maestros of the country including his Guruma, the immortal Vidushi Meera Banerjee, as a true psychic reflection of Ustad Bade Ghulam Ali Khan. Initiated into music by his mother Srimati Ira Bhattacharyya, he received further training from Sri Amalendu Pal, Sri Bhishmadeb Bhattacharyya, Sri Sukhendu Goswami and Sri Sudhir Banerjee. And then Shantanu got expansive and invaluable taalim from worshipped names of the Patiala-Kasur style, Pandit Prasun Banerjee and Vidushi Meera Banerjee. Later he studied with Pandit Ajoy Chakrabarty as a scholar at the ITC Sangeet Research Academy Kolkata. 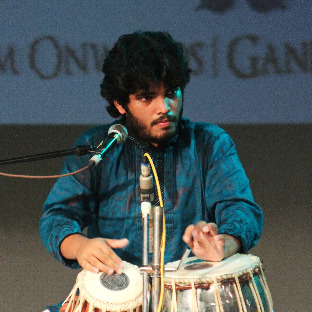 An Honours Graduate in Economics from the University of Calcutta and simultaneously a winner of all state and national level competitions in Khayal and Thumri, Pandit Shantanu Bhattacharyya has performed at the Harivallabh Sangeet Sammelan Jalandhar, Ustad Allauddin Khan Smriti Samaroh Maihar, Sangeet Natak Akademi Festival Delhi & Bhopal, ITC Sangeet Sammelan Kolkata & Delhi, Gururao Deshpande Sangeet Samaroh Bengaluru, West Bengal State Music Academy Annual Conference Kolkata, Bharatiya Sangeet Vidyalaya Dharwad, VSK Baithak Delhi, Sangeetalok Conference Ambala, Spirit of Unity Concerts Shirdi, ICCR Kolkata, Gurukul Pune, Thumri Festival Jaipur, India Habitat Centre Delhi, Swami Haridas Sangeet Samaroh Chennai, India International Centre Delhi, Ballygunge Maitreyee Music Conference Kolkata, Amir Khusro Music Akademi Concert Chennai, K.C.Das Anniversary Celebrations Bengaluru and the All India Radio National Programme. His performances have been highly applauded and best rated at the University of California Los Angeles, ICMC Dallas Texas, Chhandayan New York & Toronto, Sangeetaanjali San Francisco, Ragamala Toronto, as well as numerous other venues in the USA, Canada, England, France, Italy, Finland, Germany, Australia and Singapore.